I can’t believe this is the 17th monthly recap that I have posted for little Miss Landri Adair. Pretty soon I will be posting them for someone else, LOL! And I’m going to have to figure out whether or not I will continue updating Landri’s “resume” here or if I come up with an entirely new segment about her life as a big sister or something else moving forward… I guess we’ll have to see. Let me know if you have any ideas though! So 17 months… I know I’ve been saying this the last few months, but Landri is really starting to try to talk more. She clearly has conversations with me or is trying to – since I only understand certain words and most of what she says sounds like nonsensical babbling to me. She has a list of words that she can say, and when she wakes up, she sometimes lists them, going through them all. Scott got her up the other morning and said that as soon as she saw him, she started saying all of the words she knows, “cookie, book, ball, bottle, hot, Daddy, duck, Momma, bubble, stuck, boot, water, kitty cat, baby” etc. Kinda funny. Probably most exciting, language-wise though, is that Landri finally constructed her first sentence, and OF COURSE, just like her first word (Dadda), and her first and only chant thus far (Daddy! Daddy! Daddy! ), it was centered around her father. So yes, Landri’s first sentence was “Daddy go,” meaning that Daddy isn’t home. She has said it a few times since then and I’m trying to get her to learn other variations like, “Daddy is here,” if he’s home, etc. Still only “Daddy go” though. She also tries to repeat words (SOMETIMES, only when SHE feels like cooperating). She has tried to say “cheese” for picture taking and other random things like that. I swear she said “love you” when I asked her to the other day but am not 100% sure – could have been wishful thinking. She knows a TON of words though even if she can’t say them. She loves books/reading and you can ask her where ____ is and she will quickly point to all kinds of different things from shoes, to fish to milk and so forth. As far as skills go, Landri is getting fast – as in fast-moving. I would say that she can officially run now (as opposed to only being able to walk/teeter along). 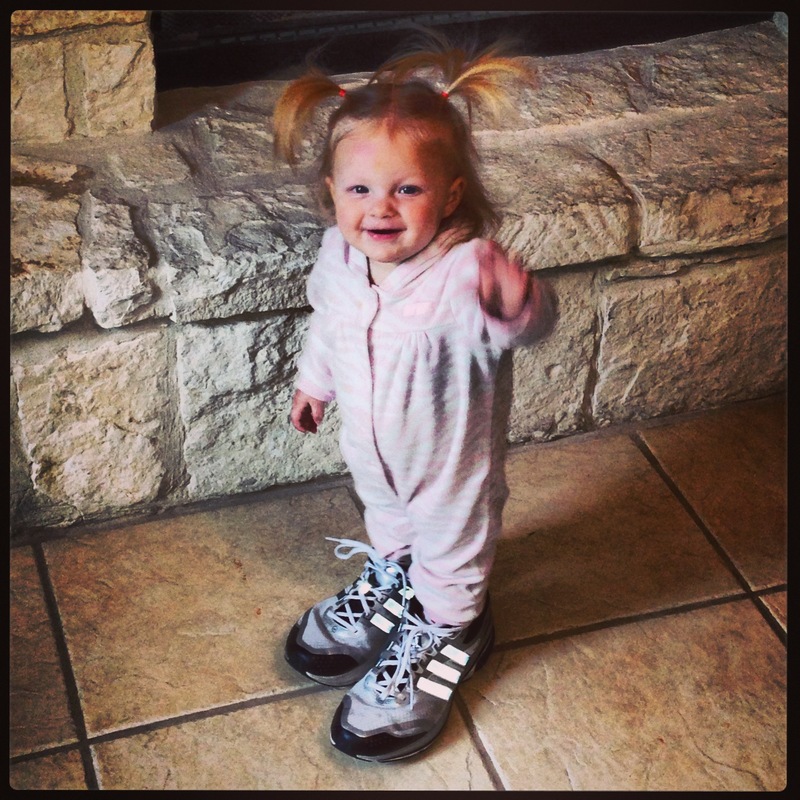 She can put on our shoes which is also hilarious, especially if she tries to shuffle along in them. She is much more enamored with Scott’s shoes than mine (are we catching the theme here???) Also new is that Landri has learned to shake her head no (not yes, only no – because why would she want to ever be in agreement?). At first it was clear that she had no idea what it mean when she did that, but I think she’s started to get the hang of it because now if you ask her if she wants more blueberries or whatever, and she shakes her head no, she might also sign that she’s all done – so she may actually get it now. Another new interesting skill is dipping chips in dips! I think this was learned on Superbowl Sunday when she dipped chips in various dips – ranch, queso, etc. She really likes doing it and looks adorable too! As far as athletic skills go, Landri is quite a baller. I’ve mentioned before that she LOVES watching basketball at the gym – but she is also obsessed with playing herself now. She has a small hoop at school that she likes to dunk, and anytime we are on a walk and see a hoop in a driveway, she starts screaming, “Ball!!! !” and pointing at the hoop. Scott said he was going to buy her a little hoop for the house which is saying a lot because he is the cheapest man that I know and never thinks that she needs toys. As far as skills that she is still working on (besides language), it would be using her eating utensils. She is still pretty bad at that and makes huge messes. Her fingers are still more effective than spoons/forks/sporks. I probably should start a new section called Bad Habits. In a previous post I mentioned the GTT (Gargantuan Temper Tantrum), and while those are still prevalent, there are a few additional bad habits to add to her list. Bad Habit #2 has to be that Landri is OBSESSED with eating dry dog food. She learned where we keep it the other day and gets into it at least 10 times per day now, shoveling HANDFULS of it into her mouth. And she actually chews and swallows and EATS it! Oh and it makes her smell really bad, and it’s impossible to stop her too. I finally gave in and was like, “Whatever, Landri, eat the damn dog food, I don’t care,” assuming she’d realize how bad it tastes and eventually just get over it – that the allure of the forbidden fruit would cause the dog food to lose some of its luster. But alas, no, it just meant that she ate even more dog food because I wasn’t stopping her! WTH?! There isn’t much that gets under Scott’s skin when it comes to Landri (translation: he basically lets her do whatever she wants, haha), but for some reason, her eating dog food really, really, really drives him nuts. It’s kind of hilarious!!! Yes, yes, I need to permanently relocate the dog food now, I realize it’s time. It’s just annoying because it’s in a very convenient spot right now. Anyhow, Bad Habit #3 is sort of along the same lines – we caught her chewing on furniture the other day (besides her crib rails which she has long ago destroyed). Yes, not only does she eat dog food, but she acts like a dog too – as I’ve said before: she’s not housebroken, she doesn’t speaking English, she loves playing fetch with her balls, she wears a leash backpack well in busy public places, she licks the floor/highchair (copying our dog, Smoke), and now apparently chews tables too!!! The best part is that she thinks it’s funny when you yell at her whether it be eating dog food or chewing the table. ARGGGG!!!!! A few random 17 month facts… Landri has a new favorite food – raisins. The girl is obsessed with raisins. In fact sometimes there are DAYS where she refuses to eat anything but raisins (yes, sadly that really jacks up her diapers). Also new, Landri played in her first “fort.” Basically I just put a blanket over a small table, but it was the first time I got her to hold still for more than 5 minutes without her being sick! She really enjoyed it! M: What is Landri’s worst habit these days? M: You don’t think eating dog food is a bad habit? S: Oh yeah, that’s by far her worst habit. M: What is Landri’s best skill at 17 months of age? S: I don’t know… dancing? M: Does she have a signature move that you like? M: What do you think will be the most challenging thing for Landri as a new big sister? S: Probably not having Momma’s attention for everything. M: What are you most nervous about when it comes to baby #2’s arrival? M: Can you hear me rolling my eyes? What holiday is coming up in a couple of days? S: I don’t know what you’re talking about… It’s not a holiday. S: We don’t get school off, it’s not a holiday! M: But it’s the holiday of love! It’s the most important holiday of the year! S: That means it’s a holiday of pain, because you’ll be in pain when you don’t get what you want. M: Well, what do you want? S: No, not what *I* want, what *YOU* want. M: Well, I’m just friendly reminder-ing you. M: What is the most annoying thing that Landri does? S: She eats dog food. I thought we already went over this.